All photos by Lorraine Sylvestre, except for George Karkoulas, photographer unknown. 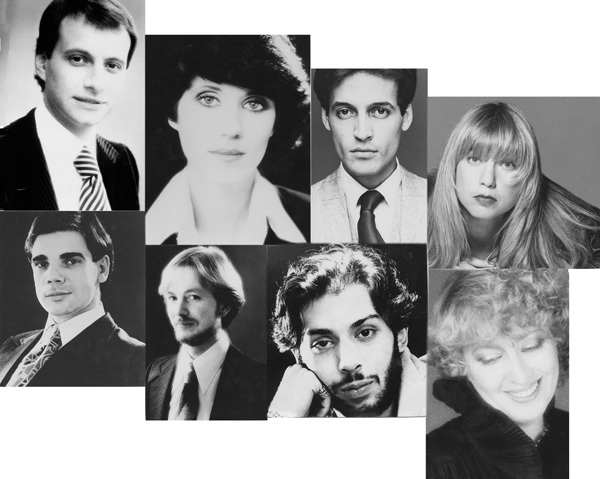 We had Camelot at La Coupe from 1975 for 4 years, a fleeting wisp of glory, when we were all in Montreal and we went on to do great things at La Coupe in New York and in Toronto, in the 80s and early 90s. Seen here some of the team who made it all possible, in the 70s and 80s. Charles Booth, 1976. At one time, owner of 3 La Coupe salons in Montreal, one in Toronto, and one in New York and La Coupe Product Lines. Without him, nothing would have happened. He started the first La Coupe, in 1967, with one other hairdresser, and me. Later, after 1974, when I had learned a lot more than I knew when I started, he let us all do our thing, and loved everything! You can see his photos in the 60s section. Kim Lépine 1976. Perhaps the first female hairdresser in America to become world-famous and certainly the most famous French Canadian hairdresser ever. The first Canadian hairdresser to be recognized worldwide, she worked with me on most of the photos seen here. Including the first-ever layered bob, with cut-in waves. Beginning in Montreal, in 1974, then in New York, we were like two halves of a whole – I usually had the hair idea and she made the idea happen, then added her own touch and technical knowledge to make them all work beautifully. Loved to watch her fingers working, so elegant. Kim worked long hours – usually her first client was at 7.30 am, she often did 20 clients a day, then worked with me at night on our ideas for photos, editorials, fashion + hair shows. And she also often gave her expertise to other members of our team. Kim Lépine is one very special lady. Louis Licari, 1976. Louis didn’t work with us on our photos, and he only ever did one hair show, which was enough for him, but he colored the hair of superstars and supermodels and VIPs in our New York La Coupe, and helped make it very famous. Louis was using foils to highlight hair before anyone else anywhere, except the man who invented them (up to then, highlights were done with an ugly coloring cap or by painting them on.) I promoted him and foils, big-time. He trained as a painter at Syracuse University, known as “The King of Color” and has his own salon in New York. He has been the hairdresser on NBC’s “The Today Show” for years. Rita Starnella, 1980s. The colorist who worked on most of the photos that came out of La Coupe New York. And the texture. There was no end to how far she would go for us. Her QuickTint product, which covers gray hair temporarily, saves my life almost every month. modern era, his Dancing Hair and more. Beloved by the society ladies of New York and before that of Montreal, this Portuguese-born hairdresser did chignons like no one else, was the perfect gentleman, always. Before he sadly passed away, far too young, he even published a book, on poetry. Jerome Pinsonneault. 1976. He came to the Montreal Salon with no clients and suddenly he was always very busy. He was an all-round amazing hairdresser, as you can see on some of the photos here. He also worked editorially, first for La Coupe’s Montreal Salon, then for their Toronto one. He has had a salon called Jerome in Calgary for years and still sends me an Erté Christmas card every year. George Karkoulas, 1980. George could have been Number One in the world; he was so creative and original. First at La Coupe in Montreal, then in Toronto. His sketches were fantastic, he made hair accessories that took one’s breath away, and would stay up all night preparing for a fashion or hair show. Or one of our photo sessions. No wonder he got a standing ovation when he walked on the stage for La Coupe’s Teach-in in 1978, before he even did a thing. George is no longer with us, he passed away in 1993, but he’ll always be remembered by those who worked with him as one of a kind. Elmer Olsen, not shown, but very much part of our team, a very innovative hairdresser who invented crimping in the modern era (see the Sleeper Collection.) He used to pay other hairdressers if he liked the face of a client or model he thought he could do great hair on for a photo. He went on to own Toronto’s leading model agency, Elmer Olsen Model Management, and has discovered some world-famous supermodels. I was very sad to read that Antonio da Costa Rocha had passed away. I knew Antonio in the mid 80’s and spent some time with him. He was a perfect gentleman, had a lovely smile and very kind along with a heart of gold. I had the chance to read some of his poetry as well as I wrote a poem about him when I first met him. I will always cherish the memories and the things he thought me. May he rest in peace. Thank you for your post. Yes, sad. And what you say is so true. He gave me a copy of that book on poetry he wrote. Had a client from Montreal a few days ago…was trying to remember La Coupe, but couldn’t….so at lunch break today I google until I find this site….truly a big fan of the work I saw in mags those days….great styles, from a great time for all of us in the hair biz. Thanks for “Splendor in the grass” and your Comment on La Coupe and the great work. Enjoy it all on the website. I loved working at La Coupe. I worked with Kim and and Antonio and I got my best training with them. Thank you so much. I now have my own salon. Jeanmichaelssalon.com In South Florida. Yes, we had Camelot. It really was. Gives me the chills to read what you wrote, Lori. Thanks. Wow !!! I wasn’t even looking for this, I stumbled upon it when I was on line, looking up La Coupe Products. Helen, you never cease to amaze me. Love the story of Camelot. How appropriate. All of these fabulous Innovators in The Beauty Industry, Such talent, I get the chills. Thank you all…. Wonderful piece! I have been a hairdresser for over two decades, coming down the Vidal Sassoon pike of hairdressers, and gratefully so. I was lucky enough to work with Diane in Beverly Hills. i have a lot of respect for her talent. But, as you say, “in the best of ways.” Thank you for kind words. Wait until I get going with your great work…soon. Absolutely stunningly laid out. I am enthralled. There is so much information well presented!